You guys might remember that we have quite the Sunday morning pancake tradition in our house. 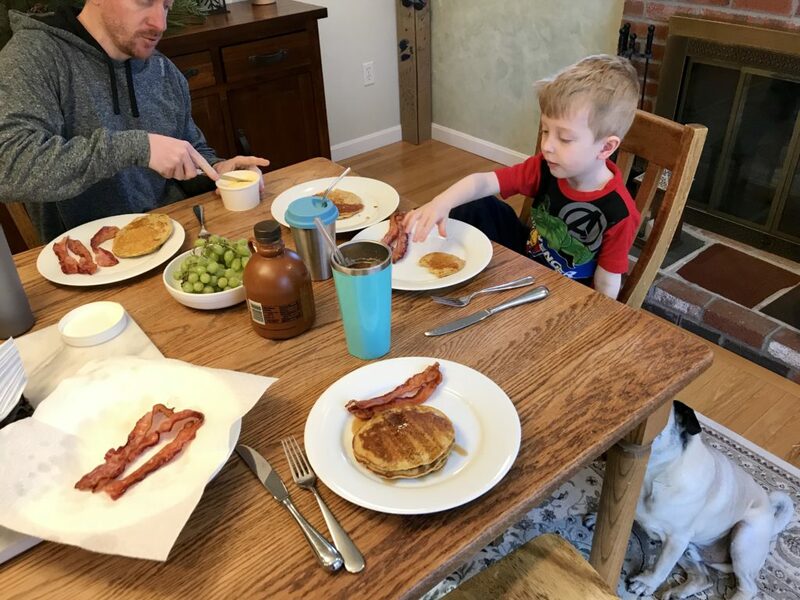 Even long before Quinn was born, Mal and I would make it a point to eat pancakes just about any weekend we had the opportunity to have a lazy morning. 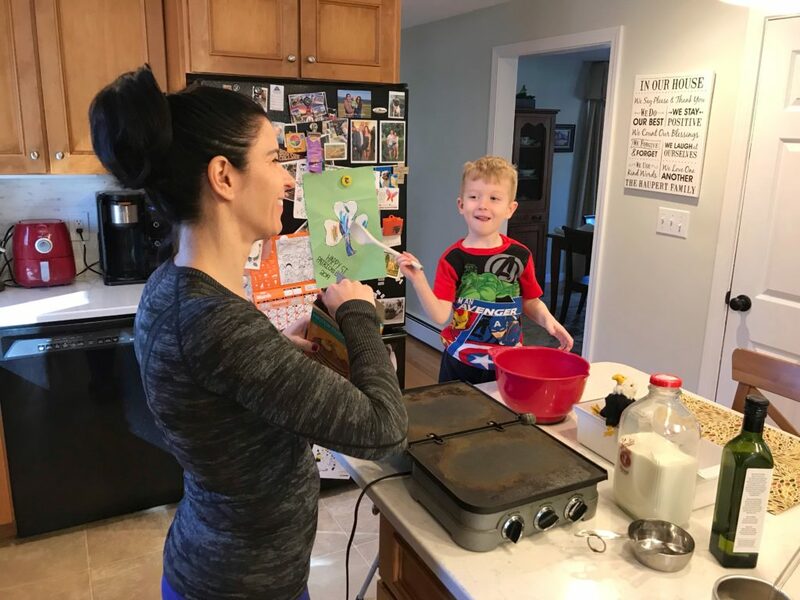 This family tradition has become so in grained in our weekend activities, we’ve started to plan our whole day around making pancakes (and bacon) for breakfast. 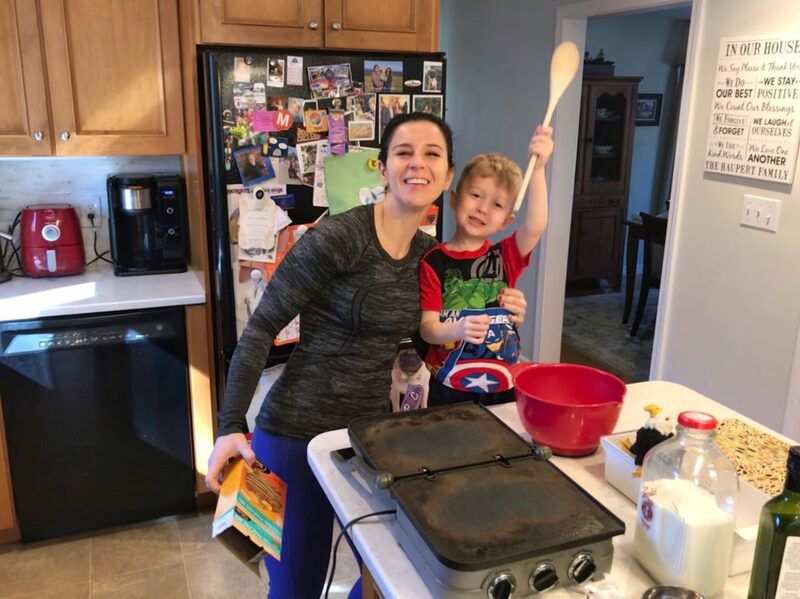 As usual, Quinn was psyched to help make pancakes, and immediately started asking me to help him get the various supplies needed, including his step stool, favorite mixing bowl and a wooden spoon, which ended up being a bow staff a la Donatello from the Ninja Turtles. Bow staffs are no joke, and I almost lost an eye walking by! It’s a good thing that I had already had some iced coffee and dodged a wooden spoon to the temple! This particular morning, we’re enjoying Pamela’s Gluten-Free Protein Pancake Mix. The brand sent me some of their pancake mixes to try. There’s 7 different varieties – all of which are certified gluten-free and made from non-GMO ingredients. There’s even grain-free as well as dairy- and egg-free options. I personally love the Protein Pancake Mix because reach serving (as prepared with milk) as has 10 grams of protein, which is much higher than most mixes on the market. We are always trying to get extra protein into our diets, especially our little picky eater. 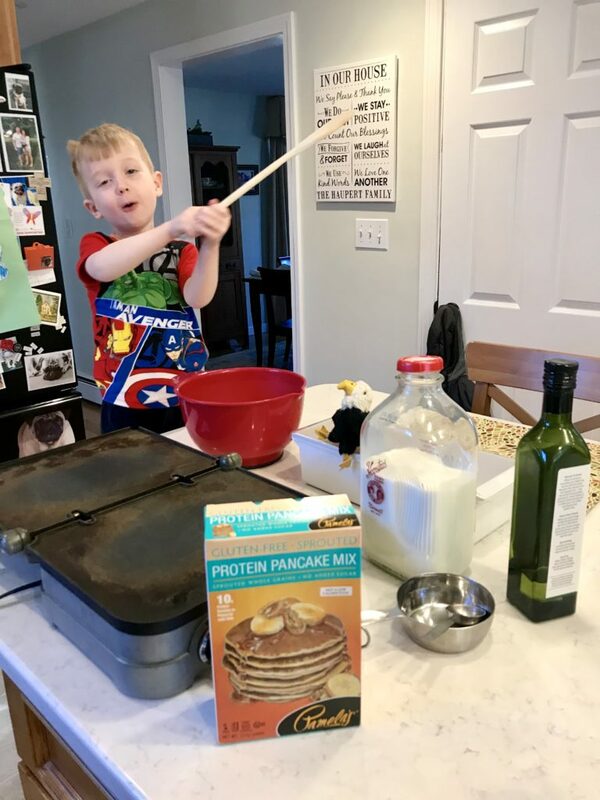 Quinn loves carbs, but it’s tough to get protein into his diet, so we love that these pancakes are a way to make that happen. The best part about this pancake mix is that it’s easy to make and tastes great – you wouldn’t even know its gluten-free! And, bonus, the mix smells delicious (as demonstrated by Quinn below)! 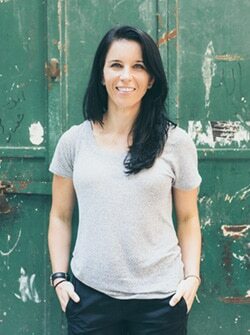 Pamela’s has been crafting delicious gluten-free and non-GMO foods for 30 years, so you can count on them to source only high-quality ingredients and maintain the strictest manufacturing standards. 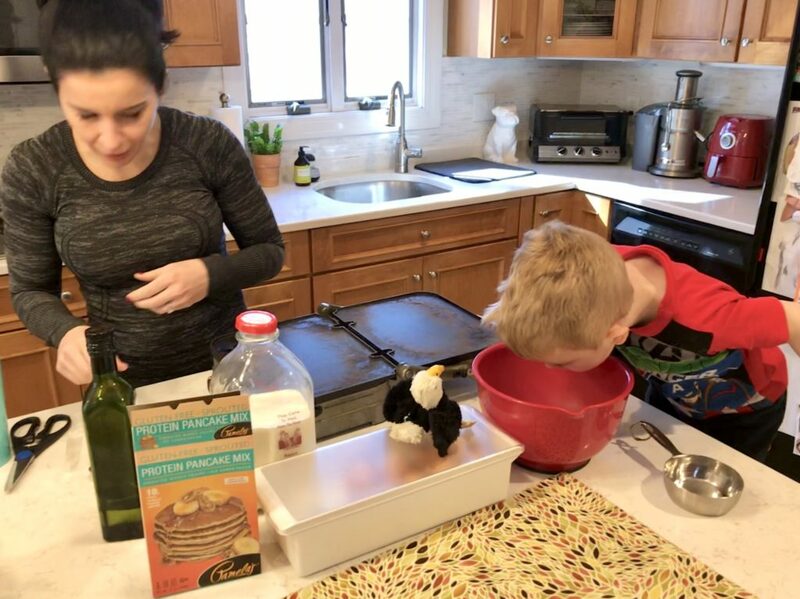 There are no artificial additives or added sugar and these protein pancakes we’re making are free from hydrogenated oils, trans fats, xanthan, and guar gum, which means there’s no funny stuff. You can purchase Pamela’s pancake mixes by visiting Amazon.com. After breakfast, I headed to the gym for a workout while the boys took a trip to the dump. 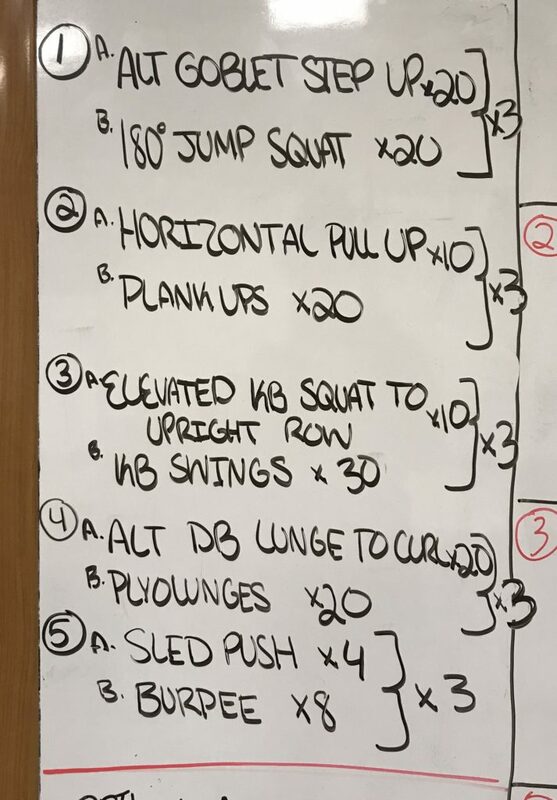 I felt a little bad that I got to work out while they were doing chores. 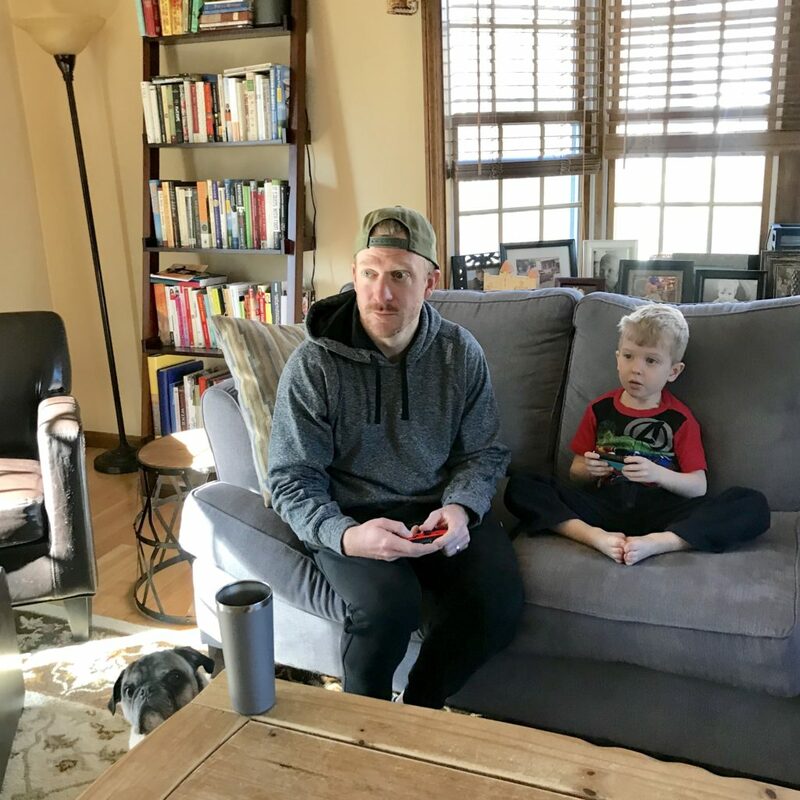 But then I came home to them playing video games, still in pajamas, so I didn’t feel all that bad. It was a lazy Sunday indeed! Does your family often enjoy pancakes on the weekend? 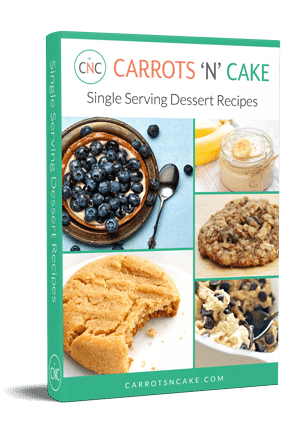 Seed Cycling Recipes - Cookies, Muffins & More! Do you guys still love your Griddler? Thinking of getting one..
Oh my gosh, YES!! We got it as a wedding gift (11 years) ago and use it ALL the time. It makes awesome pressed sandwiches and quesadillas too! And you can throw the metal plates right in the dishwasher. We seriously love it!